Not much going on in the actual running area right now. I only have a couple short runs left before the big race. Sunday was an easy 40 minutes. My wife had wedding shower/bachelorette party on Saturday night. My very responsible wife drove the restaurant but than carpooled with others, I'm sure to save on gas and NOT for any other reason (yeah, right?). Since I run all over, I mentioned to to her no need for both of us to go pick up the car, I'll just run to it. Then off I went, with my wallet and key. Hmmm....maybe I do have a running problem. The Heed subtle Mandarin orange was the winner of the taste test. I bought a canister at Scheel's this weekend and am now getting prepared for the race. 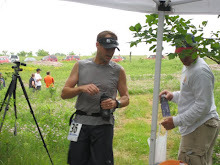 I am a huge nerd, I put together a spreadsheet with detailed drop bag information, what I need to do at each aid station, what and when I need to eat, when I need to change clothes, etc. For example, in case anyone was wondering, I plan to change by shirt and socks at mile 33. I plan to also take an electrolyte supplement, mix my Heed, refill my water bottle, eat real food, and reapply sunscreen. Really - is it race time yet??? ?